Herbal infusions and decoctions – a lovely cup of tea or something more! Tea, camellia sinensis, is probably one of the most undervalued herbs in the modern world. We all know how a cup of tea is a great ‘pick me up’ after work or shopping for example. However, did you know it can also be great at relieving headaches and in Chinese medicine has been used to treat diarrhoea (Chevallier, 2007) For many the first introduction to the wonderful world of herbs is through a herbal tea, an infusion or decoction made with a plant other than camellia sinensis. We all know how refreshing mint tea can be after a meal or how relaxing chamomile tea can be before bed. However, did you know that herbal teas have some great medicinal qualities that we can all benefit from and that are easy to prepare and enjoy. First let’s explore the difference between an infusion and a decoction. Basically, an infusion is similar to how you prepare and drink your normal cuppa. Pouring hot water over your dried herbs and leaving for around 15 minutes to ‘infuse’ before straining and drinking. Infusions are great for softer ingredients such as leaves, flowers and softer stems and are great for extracting the aromatic oils, vitamins and enzymes from the herb. In addition to tasting great hot, they can also be drunk cold, for example lemon balm tea is lovely and fresh with ice and a mint leaf! A true cold infusion can be made by pouring cold water over your chosen herb or herbs, covered and left in the fridge overnight. A little tip, put your herbs in muslin and then they can be removed easily when ready to drink. A decoction is great for roots, berries and seeds which are harder to break down to release their nutritional and medicinal values. The dried herbs are placed in a pan and covered with water which is then heated to a simmer for between 20 and 45 minutes but can be up to 2 hours depending on the herbs. Strain and drink and if you require a bit of sweetness, then try some raw honey. So now you know the difference, what properties do the plants and herbs used release that are so beneficial to us. As medical herbalists, we look at the constituents within a plant or herb. This is important, as those constituents tell us what action will be provided by that infusion or decoction. For example, chamomile contains flavonoids and terpenoids known to help several conditions including anxiety (Srivastava, Shankar, & Gupta, 2010). Therefore, it stands to reason why an infusion of chamomile helps us relax at bed time. 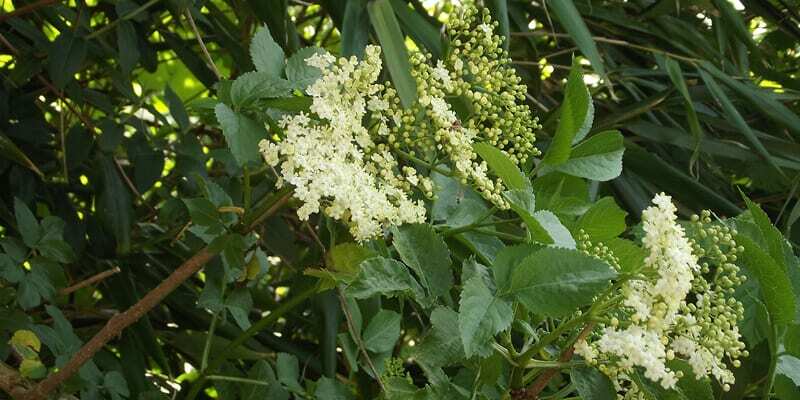 Elderflower can be found in the hedgerows and lemon balm is a commonly grown herb. If you can’t find fresh then dried is fine, Just reduce the amount by a third however, as taste can be subjective, you can ‘tweak’ to find the taste you prefer. 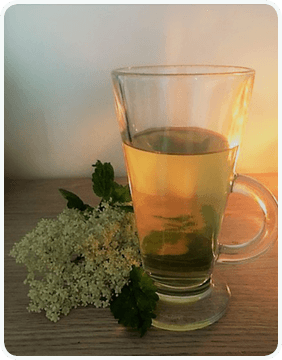 Elderflowers have been shown to help cold and hayfever symtpoms while lemon balm is great at helping congestion and allergies. With all the colds and hayfever going around at the minute, this is a great and simple way to experience a herbal tea in action. Have a cup of this tea up to 5 times a day. Its lovely and refreshing cold too. Wash well and place into diffuser/strainer, cover with boiling water and leave for around 15 minutes to infuse. If using a tea pot take 15g fresh flowering tops and 15g leaves and cover with water. You can then cover and store in the refrigerator and drink cold as required. A word of caution, if you are out foraging and not sure about the identification of a plant or herb then please don’t use it!